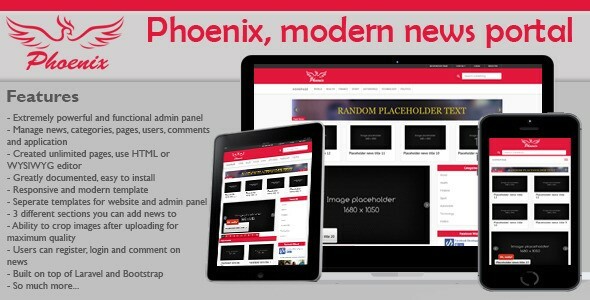 Phoenix v1.4 - modern & minimalist news portal - CODELISTPRO | Free Premium Scripts, Plugins, Apps Source Code. Phoenix is a modern news portal. It contains an extremely powerful and functional admin panel, where you can nanage news, categories, pages, users, comments and the whole application. Phoenix is greatly documented and built on Laravel 4 framework and Bootstrap 3. Application uses two templates and both are fully responsive.